Days 15 & 16 ~ Capes, PJ Pants & Nightgowns! – Everything Your Mama Made & More! Days 15 & 16 ~ Capes, PJ Pants & Nightgowns! So the last week has mostly been spent cutting out lots of super hero capes and their pieces as well as dresses for the dress swap & reworking and drafting some PJ patterns! This means I get to spend the next few days doing LOTS of sewing. So last night I started out with cute matchy monster PJ bottoms for Zander, baby Parker & Zanders little boy cabbage patch doll! 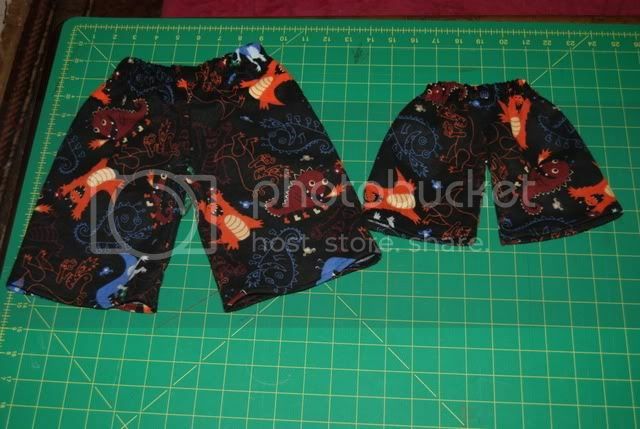 For these I used CarlaC’s ‘Easy Fit Pants’ pattern from You Can Make This. Zander’s are a size 5, the ones I made for Parker I sized down the 6m pattern to make a size 3m & then I made the pants for the cabbage patch doll using the 15″ doll pants from the free ebook that came with the pattern. I think after getting the patterns set up it took less then 1 hour to make all 3 pairs? These are the 2 small pairs. The fabric is snuggle flannel that I bought at JoAnn’s last year on black Friday for $1.49 a yard :). Then today I got one cape set completely finished, only 24 more to go! Between cutting out cape orders I finally got a chance to try out the peasant nightgown pattern I drafted. The twins LOVE them & I am happy with them, though next time I will be making the sleeves at least .5″-1″ longer. The fabric is some super soft unicorn fabric I picked up 3 years ago from a Walmart in Canada while on vacation, I think I only paid $2.97 a meter? Here are the girls & Zander after testing them out at nap time. The first thing Carlie said when she woke up is that it was very ‘cozy’ so I think it was a hit! So far this month I have sewn up 25 1/4 yards & we are just at the half way mark, I have a LOT more in-store. It all looks great Kimy! I am excited to get your pattern for NICU smocks! You sure are a busy lady! Hopefully I will have the NICU pattern up early next week. 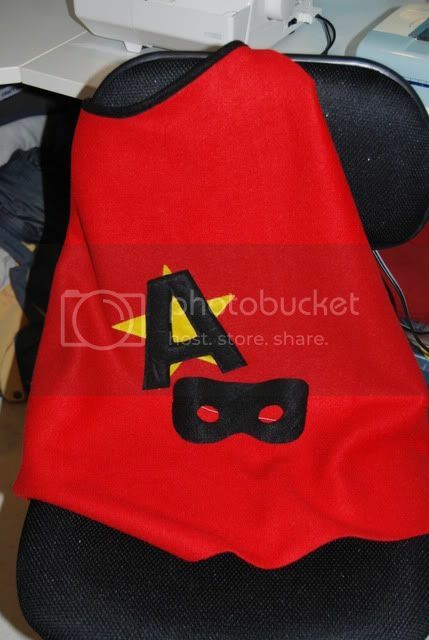 I keep meaning to get to it & all these cape orders keep pushing it back! 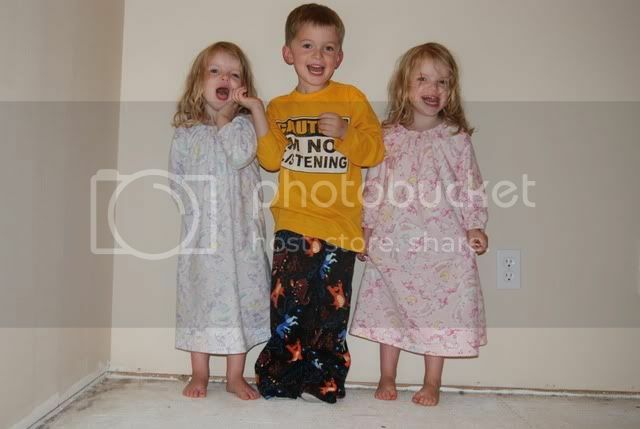 Love the nightgowns, so “cozy” looking and the boys pants are adorable. Where do you find all that time to sew. 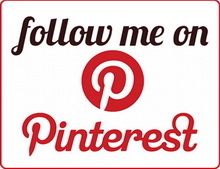 I want some – between my kids and trying to start up a marketing business I never seem to get a foot in the door of my sewing room before someone is yelling for me. Love the nighties! I am up in Canada and I have that unicorn fabric too! So this post made me smile remembering the blanket I made for my daughter with it! Cheers!